Tianlong Tunbao is located around 67 kilometers from Guiyang and 30 kilometers from Anshun. ​As an old hamlet originally built in the early Ming Dynasty (1368 - 1644), Tianlong Tunbao in the karst mountains features the well-preserved Ming buildings and the Ming lifestyle from generation to generation. Tianlong Tunbao is the social culture of the Ming Dynasty in microcosm. Entirely built in stone, the old buildings around the village features the architectural culture in the Ming Dynasty. The villagers are also Han People but distinctive from the Han People in other parts in China. The villagers are the descendants of the soldiers of Jiangsu and Zhejiang. The customs and culture of Ming Dynasty has passed on from generation to generation. Visitor can explore the unique buildings but also the unique culture there. They can appreciate the one-of-a-kind drama - Dixi Drama in the village. Only the men villagers are allowed to wear Dixa costume and perform Dixi Drama. There is no fixed or designated stage for the Dixi Drama. It can be done at any place. 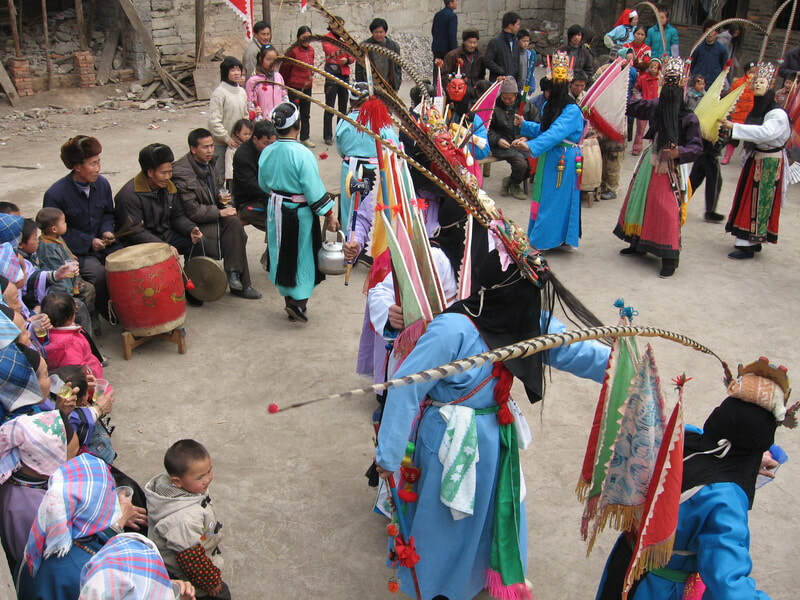 The women villagers always wear the Ming costume called Fengyang Han Costume (凤阳汉服). They wear blue or navy blue robes with colorful embroidered lace on the cuff and a black and wide waistband around the waist. If interested, visitors can experience Yuhuang Temple Fair (玉皇会) on the 9th of January in the Chinese lunar calendar, Welcome Mr. Wang Festival (迎汪公) on the 16th of January in the Chinese lunar calendar and Worship God Thunder Festival (敬雷神) on the 24th of June in the Chinese lunar calendar and so on to know more about the local culture. The best time to visit Tianlong Tunbao is from April to October. As Tianlong Tunbao is in Anshun where Huangguoshu Waterfall is situated, it is recommended to visit the two attractions from May to August. If visitors want to experience the local culture in depth, they can visit the ancient village during the local festival days. As the transportation in Guizhou is not developed, there is no direct bus to Tianlong Tunbao. There are only a few options. Rent a vehicle from Guiyang or Anshun to Tianlong Tunbao. This is the quickest and most direct option. Take a bus from Guiyang Bus Station (贵阳客车站) to Anshun. Get off at the exit of “Tianlong Highway” (天龙高速). Then, walk to the village (3 kilometers from the village) or take a local motorbike to the village. ​Take a bus from Guiyang Bus Station to Pingba (平坝). Then, take a bus from Pingba Bus Station to Tianlong (天龙). Take a bus from Anshun to Zhongba (中巴). Get off at Tianlong. Take a bus with the route of Guiyang - Yangwu (杨武). Get off at the Tianlong Town. As at 28th June 2018, entrance pricing to Tianlong Tunbao, Tiantai Mountain and the round-trip shuttle bus is 80 CNY per person; children under 1.4m (1.4m not included) and the elder above 60 years old (60 years old included) are free of charge. For the latest pricing information, please contact us via email (info@wendyweitours.com). If you have enough time, you can visit Tiantai Mountain near the village. Some tourists who visited the mountain think it is not worth buying the ticket for Tiantai Mountain to climb it. Interested in visiting Tianlong Tunbao on a Tour? Wendy Wei Tours offers a variety of different packaged tours as well as custom tours including Tianlong Tunbao, among other attractions and destinations. To find out more, please visit our Tours page or Contact Us directly to find out more.